Opportunities abound at Noble Systems for people who work hard and want to learn and contribute. In 2016, almost a quarter of our team will celebrate 10 years of service – a rare standard in the technology industry, and a reflection of our strong culture. Noble Systems Corporation, a global leader in unified contact center technology solutions, announced that it has been named as a 2016 Tech Culture Award winner by TMCnet. The Award honors technology organizations who have developed a positive, productive and performance-driven culture and fostered a creative, collaborative workplace environment. To receive the award, Noble Systems demonstrated its commitment to growth through providing a truly distinct and upbeat environment. The company’s philosophy is to hire smart people and to put the right people with the right skills in the right places – and then give them the tools to gain new knowledge and skills, and to grow with the organization. The result is an established company with impressive employee tenure that offers room for advancement and a strong benefits and training program, and combines a serious work attitude with great perks and fun options that build employee satisfaction. 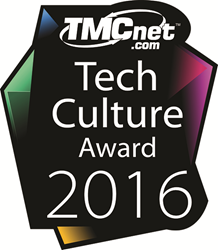 The complete list of Tech Culture Award winners for 2016 is now posted on the Tech Culture blog on TMCnet, the leading website for building communities online, in person and in print for communications and technology markets. Noble Systems Corporation is a global leader in the customer communications industry, providing innovative solutions for Unified Communications, Workforce Management, and Analytics. Tens of thousands of agents at 4,000+ client installations worldwide use Noble platforms to manage millions of customer contacts each day. Noble offers a unified suite of inbound, outbound and blended omnichannel communications, strategy planning, and resource management tools for companies of all sizes. Our premise, cloud and innovative premise/cloud hybrid platforms include ACD, predictive dialing, blended processing, recording and monitoring, IVR, messaging, interaction analytics, decisioning, and workforce management. For more information, contact Lee Allum at 1.888.8NOBLE8 or visit http://www.noblesystems.com.